In rain and in sudden temperature drops the inside of the headlight show condensation. There have been a lot of tries to prevent this natural effect but none of them was really successful, they all had their drawbacks. I refreshed my knowledge in thermodynamics, built a number of prototypes, tested them until I had the perfect solution for me and you as well. 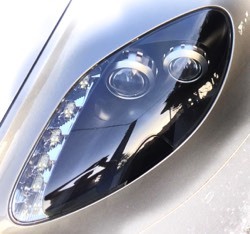 The head light pod contains normal air which condenses under certain circumstances such as a strong temperature drop or when the glass is cooled by rain, the humidity is then seen as mist on the inside of the glass. My unit dehumidifies the air that is sucked into the light housing when the cooled air contracts (about 0,7 Litres per ten degree) and reduces the relative humidity in the head light. Well, no humidity in the air – no condensation, it’s that simple. An additional benefit is that the electronics inside the light is protected from humidity and in hard cases from water. The visible parts are made from billet Aluminium with sandblasted finish to perfectly blend into the beautiful engine room. I am happy to develop suitable mountings for other Aston Martin models. Just enquire via Email. To learn my striving for quality, visit My Philosophy page. You can’t imagine my excitement - zero condensation, how it should be - my system worked perfectly. The year before a similar situation occurred - my condensation prevention hadn’t been installed then - the headlights had been completely fogged up. It is my pleasure to help you with the installation, please inquire. 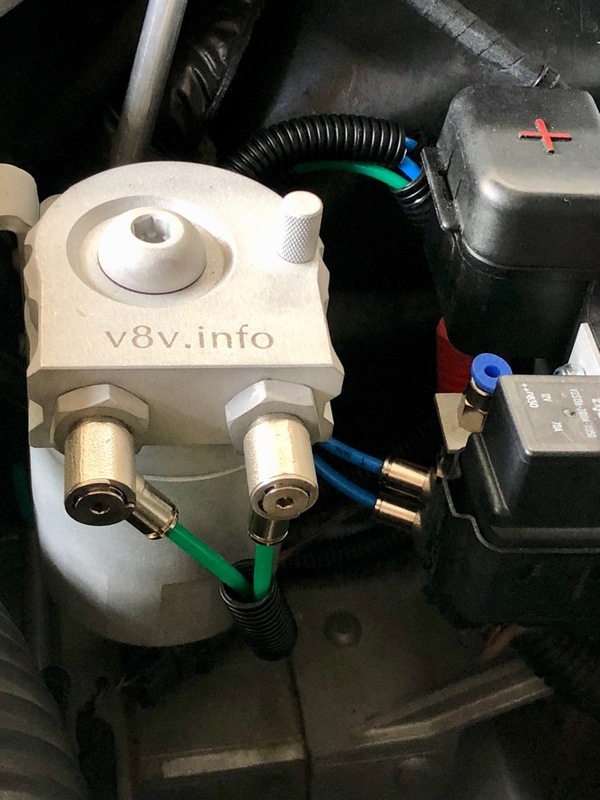 As my car is not accessible during the winter and I have to check little details to be able to supply an absolute perfect solution, I kindly ask you to be patient until spring. You are most welcome to subscribe to my Newsletter to be immideately informed as soon as the kit becomes available again.